A wonderfully moist and flavorful keto carrot cake is made with almond flour. A truly easy recipe, it’s a one-layer cake that you can quickly mix by hand. I made it for the first time last year and have made it a few times since, but never got around to photographing it for the blog. Today I finally did. I’m so glad I can share this very tasty cake with you! I’m a very lazy cook, and almost always make simple, one-layer cakes such as this Greek yogurt cake or this almond flour chocolate cake. I only make layer cakes on birthdays. So this keto birthday cake is a rare occurrence in our household! So I knew that I wanted this keto carrot cake to be a simple one-layer cake, made in a square 8-inch pan. I also knew that I wanted to frost this particular cake. It’s excellent without frosting, and when you don’t frost it you can serve it for breakfast. But there’s something about carrot cake and cream cheese frosting – it’s such a classic combination. So I settled on a very simple and easy keto carrot cake that you mix in one bowl and bake in a square 8-inch pan. The frosting is very simple too – it’s just cream cheese, vanilla, and a sweetener. Scroll down to the recipe card for the detailed instructions. I like to use stevia glycerite (link provided in the recipe card below). I don’t tolerate sugar alcohols too well (not even erythritol), and I believe that stevia is the healthiest non-nutritive sweetener. If you’d like to use another sweetener, you’re welcome to give it a try. Any granulated sweetener will probably work (add a little water or milk if the batter becomes too thick). As for maple syrup or honey, you would need to tweak the recipe to accommodate a liquid sweetener. Perhaps add a bit more almond flour – I truly don’t know. Can I use pre-shredded carrots? Yes, with a caveat. Ideally, you would grate the carrots very finely by hand or in a food processor. But as I said, I am lazy. So I buy pre-shredded carrots and give them a quick extra chop before using them since they tend to be shredded pretty coarsely. Keep in mind that coarsely shredded carrots will affect the cake’s texture – they cook “al-dente” inside the cake. I like this texture. But if you want a softer and more uniform texture, you should use finely grated carrots. Yes. You can use soft unsalted butter. 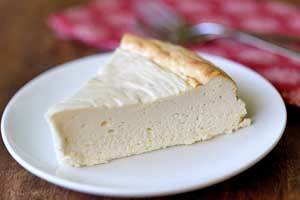 Butter is very tasty, but I feel that the oil helps keep the cake extra moist, and avocado oil is healthy. But butter should work too. I use the simplest frosting – cream cheese, vanilla, and stevia. Lacking butter or powdered sugar, the frosting is on the soft side, but it’s very tasty and it’s sturdy enough that you can certainly keep the frosted cake at room temperature for a couple of hours. For a sturdier frosting and a milder flavor with less tang from the cream cheese, you can use half cream cheese (4 oz) and half unsalted butter (4 oz). I usually prefer to cut the cake into squares and then frost each square. I feel that this makes it easier to remove the cake from the pan. But you can line the pan with parchment with an overhang so that you can pull the cake from the pan when it’s cool, place it on a platter or on a cutting board and frost it. Then you can cut the frosted cake into squares. It’s really up to you. But carrots are not low-carb! According to my calculations, a big slice of this cake (I cut it into 9 squares) has 7.7 grams of carbs and 3.1 grams of fiber. I believe this would be considered low carb by most. However, if this recipe is not a good fit for you, no worries! I’m sure there are plenty of other tasty low carb cakes that you can enjoy. Once completely cool, keep leftovers of this keto carrot cake in the fridge, in an airtight container, for up to 5 days. Remove them from the fridge 30 minutes before enjoying them. Just like any other spice cake, this cake actually improves with storage. It’s moister and more flavorful the day after you bake it. A wonderfully moist and flavorful keto carrot cake is made with almond flour. A truly easy recipe, it's a one-layer cake that you can quickly mix by hand. Preheat oven to 325 degrees F. Generously butter a square 8-inch pan. Or line it with parchment with an overhang and spray with oil. In a large bowl, whisk together the eggs, oil, and stevia until combined. Mix in the almond flour, using a rubber spatula and then a hand whisk. Whisk until completely smooth. Whisk in the cinnamon, allspice, kosher salt, and baking powder. Transfer the batter to the prepared pan, smoothing it out with a rubber spatula. Bake until puffed and fragrant and a toothpick inserted in center comes out clean, about 25 minutes. Cool in pan on a cooling rack until completely cool, about 1 hour. When cake is completely cool, make the frosting: whisk the soft cream cheese, stevia and vanilla with a hand whisk until smooth and fluffy. Run a knife around the edges of the pan to loosen the cake. Cut the cake into nine squares. To remove each square from the pan, firmly slide a cake server underneath each slice and lift it out. 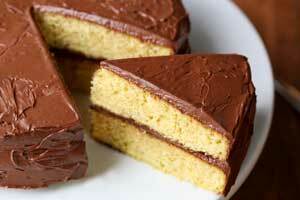 Using a soup spoon, divide the frosting evenly between the cake slices. Use a small spatula to spread the frosting evenly on top of each slice (just like you would frost a cupcake).